Turco, I. – Ferretti, G. – Bacchetti, T.
Súhrn: The dietary consumption of legumes is associated with a lower incidence of chronic degenerative diseases. Among legumes, a growing interest is devoted to Faba bean (Vicia faba L.), also known as broad bean. Faba bean nutritional properties have been previously studied and several polyphenols (mainly flavonoids) have been evaluated in broad bean extracts. 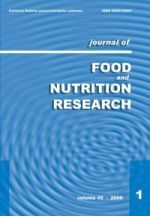 In our study, the literature on polyphenol content in different varieties of Faba bean and on factors that modulate their levels was reviewed. Also, data on bioaccessibility and bioavailability of the main polyphenols contained in Faba bean were reviewed. The molecular mechanisms, antioxidant, anti-inflammatory and anti-diabetic properties, by which Faba bean polyphenols could be involved in the protection against the development of human diseases are described.